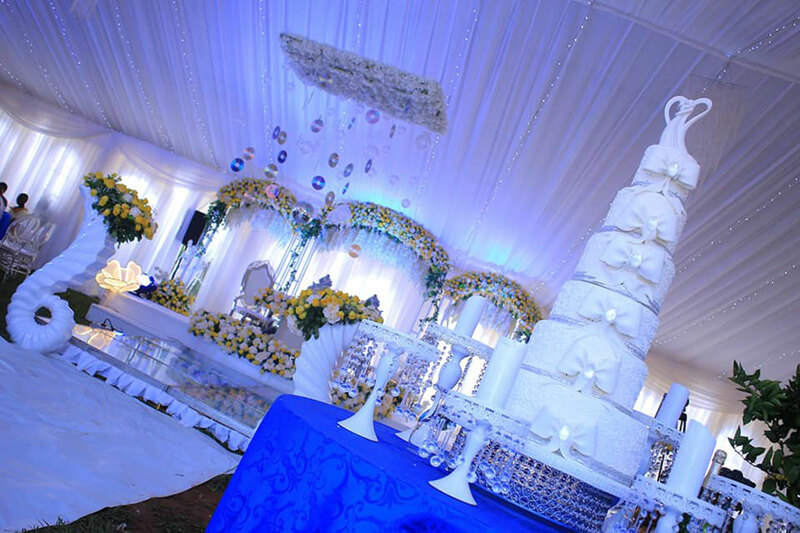 According to experts, the selecting of an ideal wedding venue has to be done carefully if it is to turn out fantastic. Your venue will largely affect how your decor will be done. Paul Luswata, a decorator with Pius Events says that most people do not give it much thought and simply copy from what has been tried by family and friends in the past. He gives an example of a client who booked for an outdoor wedding but a week before when he attended a friend’s wedding and the heavy rain blew the tents, he immediately called and requested that they should book an indoor venue and was ready to pay more for it. 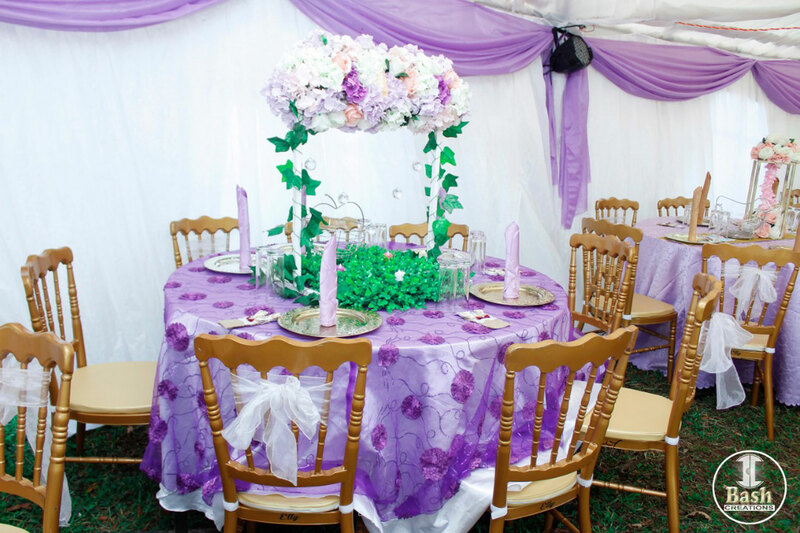 Diana Habasa, a decorator with Dream House Events and Luswata give some differences in the kind of decoration and set up expected for an indoor and out-door wedding reception. Outdoor receptions are nice for exploring unique and interesting spaces for wedding celebrations. Locations include gardens, beaches, or lakefront locations. What’s even better is that the couple can hire the venue for church wedding, photo-shoot and reception all at once. Luswata says that despite the fear of outdoor events being disrupted by rain, people still opt for them and strategically hold their ceremonies during dry seasons of the year like October, November and December. 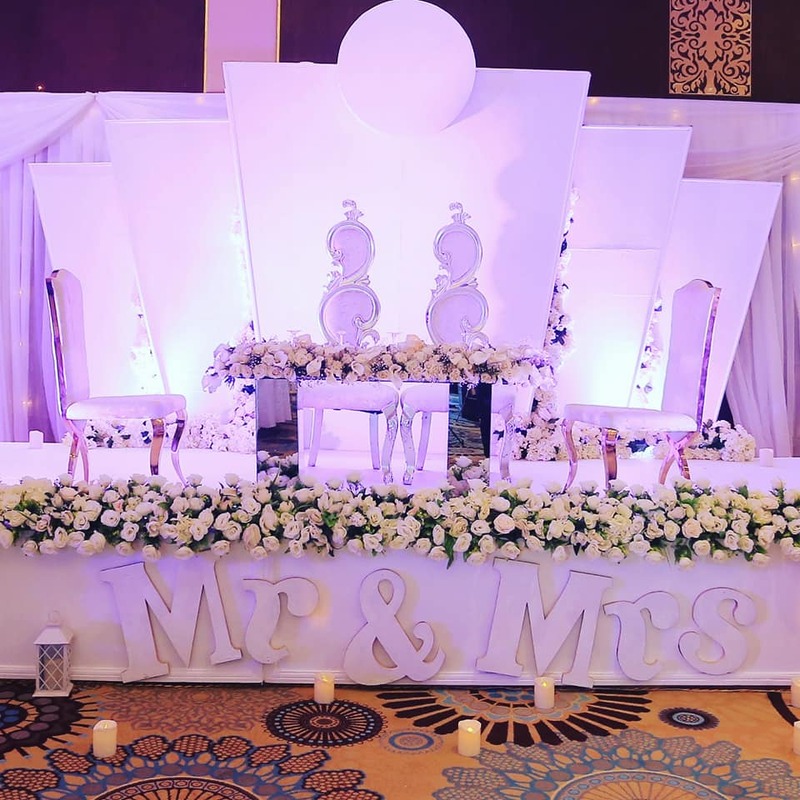 He explains that a garden wedding venue in a naturally beautiful setting, means less time and cost will be spent picking out decorations because the location itself is able to complement the decor with its greenery. “Even today, there are people who have adopted the European style of setting up outdoor sitting arrangements without tents as long as the venue has convenient shade,” Luswata elaborates. 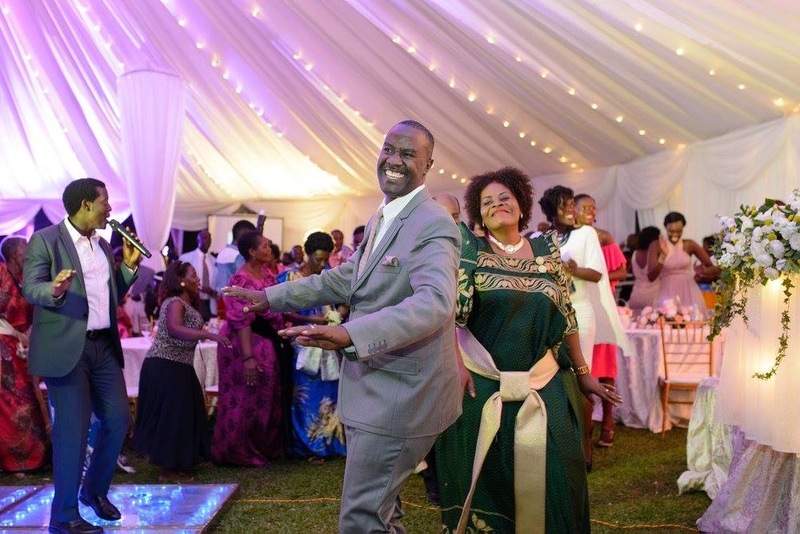 An example is the wedding ceremony of Brian Nasala who works with Advocacy and Communications at International Justice Mission and his wife, Sandra of German origin who managed to hold a lovely garden venue without tents for the church and reception at Speke Resort, Munyonyo, Kampala on January 7, 2017. The bridal stage is usually the focal point of every wedding reception. Many professional decorators allocate the biggest chunk of the decoration materials to it. Luswata explains that in outdoor wedding receptions, a gazebo structure is usually constructed for the married couple and their entourage in order for them to stand out. 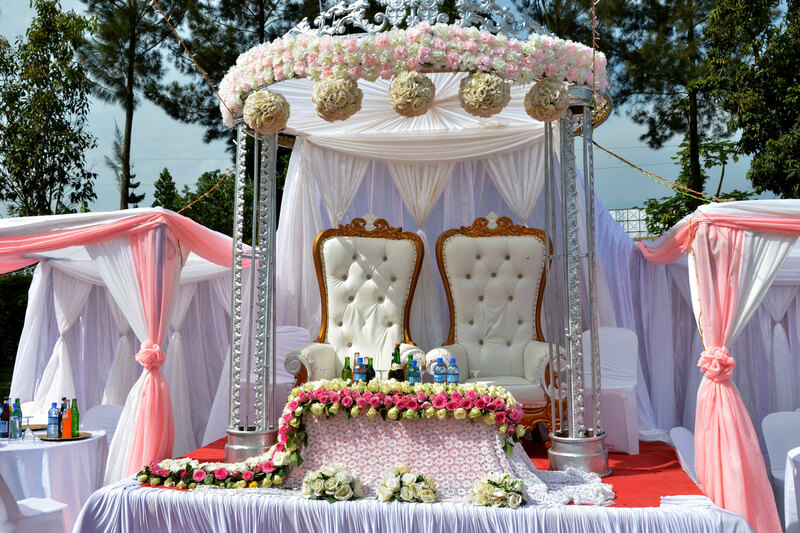 “There are small gazebo sizes that can only accommodate the couple, which may cost roughly Shs500,000 and the medium sizes which can include the entire entourage for Shs800, 000 and above, depending on its make and designs,” he says. “Also, we usually put the brightest lighting, well-crafted décor and a gold or silver glitter table and chairs or a couch for the couple to stand out,” he explains. According to Habasa, bright colours look good at an outdoor reception when used with a variety of vibrant decorations, detailed floral arrangements, colourful ribbons and bright balloons. “A wedding theme with a carnival of colour is a wonderful choice for a summer look no matter what the weather,” she explains. Luswata explains that during day time, the sun rays offer the perfect lighting which cuts on the costs and also is perfect for clear photographs. And at night, chandeliers become useful when placed on specific sides of the tents to offer light in different directions. 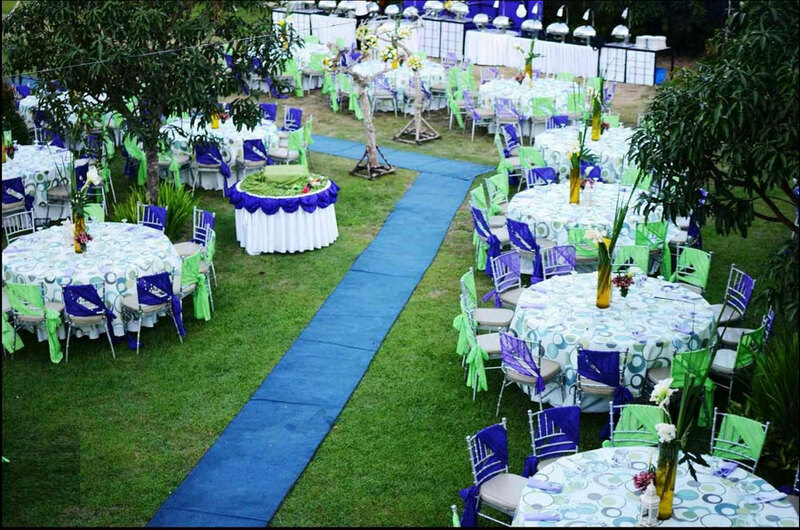 Outdoor venues usually provide lots of space for using different kinds of decorations. “With outdoor venues we are able to utilise the ample space to widely separate the table settings as there is more room for guests to move around, socialize and relax,” Luswata explains. He adds that this type of sitting arrangement better displays the decorations on the chairs and centerpieces on the tables. According to Luswata, in the case of a wedding at the beach, they usually opt for wooden or metallic chairs because the windy nature at the shores cannot easily blow away plastic chairs. “But for garden receptions, it is okay to use plastic chairs covered in plain white or colorful sheets and designed with ribbon decor because they are even less expensive,” he recommends. 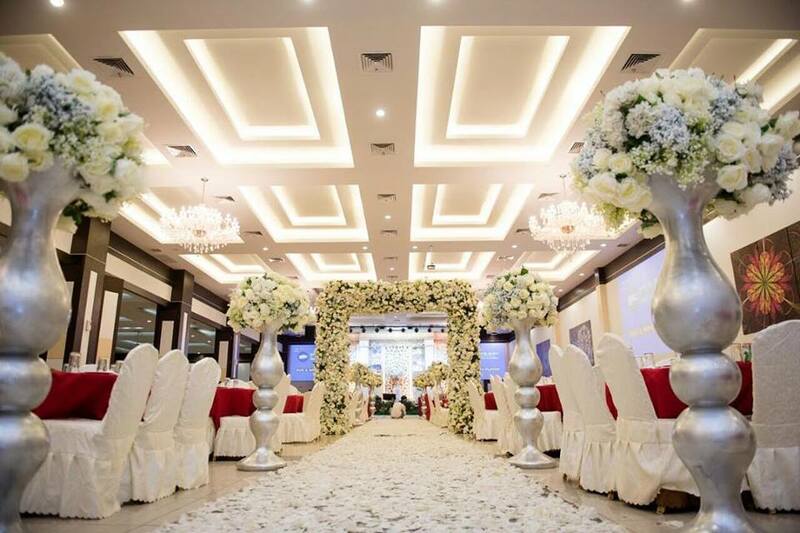 Indoor wedding venues such as banquet halls or hotels are good choices for one who would want to enjoy peace of mind and comfort without worrying about having their big day affected by unpredictable weather, expensive tent rentals and setting up. 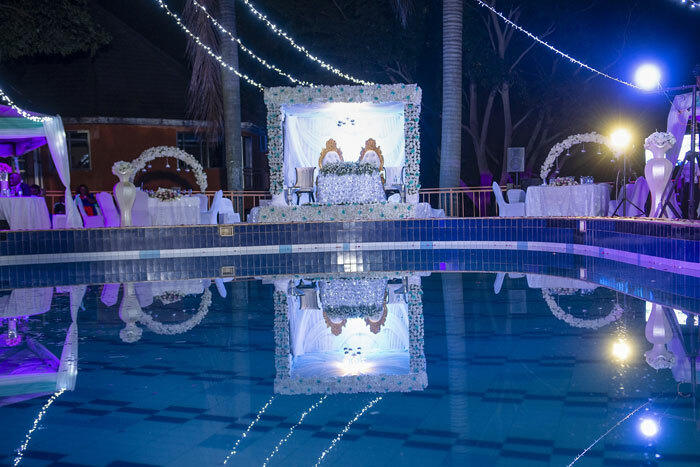 Luswata says that Indoor venues are beneficial in cutting costs on extravagant decorations as their walls and ceilings provide ample room for beautiful décor and elegant adornments. “For the walls they can be left bare if they are presentable like in hotels or you can adorn them with white drapes to create a dreamy ambiance and cover old looking patches on the wall,” he elaborates. “The availability of ceilings enables the easy hanging of chandeliers as a beautiful way of bringing elegance to the room and illuminating the setting since indoor rooms are usually dark except for hotels that already have large bright lights,” Luwsata explains. According, to Luswata an indoor structure makes it easy for one to determine where the high table for the couple will be set compared to outdoors. 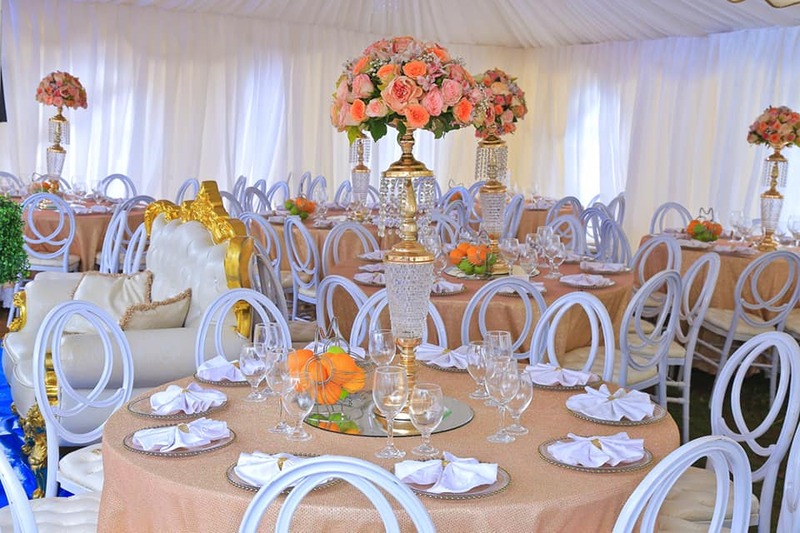 “We majorly concentrate on putting elegant floral arrangement, table cloths and center pieces and just as like for outdoor, a lot of glittery materials is used to make their seating shine from a distance,” he explains. Habasa says that indoor venues can easily look good with any color theme whether bright or basic as long as it is carefully and creatively decorated. As long as you are clear about what type of venue portrays your personal style, there are available sources of information whether from decorators or the internet that can guide and help you have a creative and unique decor. For the prices for decorating, Paul says that in most cases they are negotiable but a simple package can roughly cost Shs2m and while extravagant packages are from from Shs8m to Shs25m.